Bill Gates set a goal when he co-founded Microsoft in 1975 of making possible “a computer on every desk and in every home.” Now that dream has long been achieved, Microsoft is in search of its next mission. Goal-setting is not easy as the rapid evolution of technology profoundly changes the world often overnight. The rise of the mobile internet has migrated users to smartphones and tablets from desktop computers as Apple’s iOS and Google’s Android operating systems have eroded the dominance of Microsoft’s Windows system. Software developers and corporate clients increasingly rely on open-source architecture where Microsoft has no traditional strength. In about 10 years, Microsoft lost its direction, said Kang Rong, Microsoft’s China marketing head. “We were still a profitable company but without a goal,” he said. Business leaders including Amazon’s Jeff Bezos and SoftBank’s Masayoshi Son have issued chilling warnings that most large companies tend to have a lifespan of just 30-some years. Microsoft, now 43 years old, will need a soul-searching transformation to regain its glory, analysts say. “We're at the start of something new and at the beginning,” Satya Nadella, Microsoft’s chief executive, told Caixin in an interview in Beijing. He discussed efforts to transform the PC-focused giant into a new leader of the mobile era that started after he took the company’s helm four years ago. “There was a time that people had lots of doubts on Microsoft,” said Harry Shum, Microsoft's senior global vice president. But confidence is now reviving, he said. 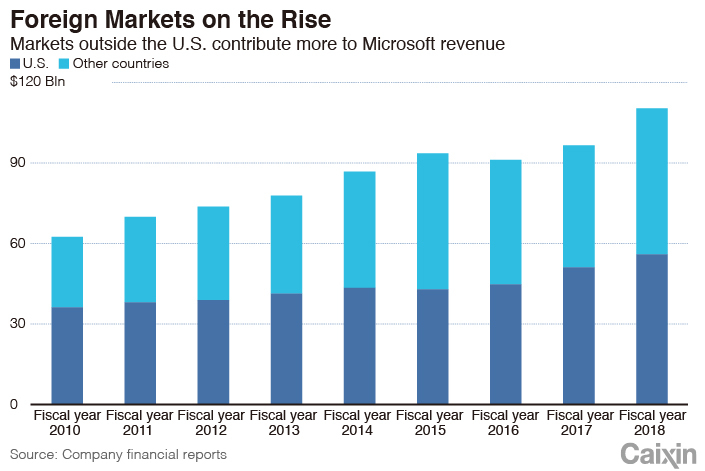 The direction of Microsoft has significant implications for China’s booming tech industry. In 1998, Gates set up Microsoft’s second overseas research center, Microsoft Research Asia, in Beijing. 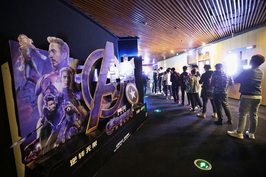 It became the cradle of the country’s young tech leaders, including Wang Jian, tech chief of Alibaba, and Tang Xiaoou, the founder of leading AI company SenseTime. While the global software giant was one of the first foreign tech companies to tap into the world’s largest consumer market, critics say Microsoft has moved too slowly in China. 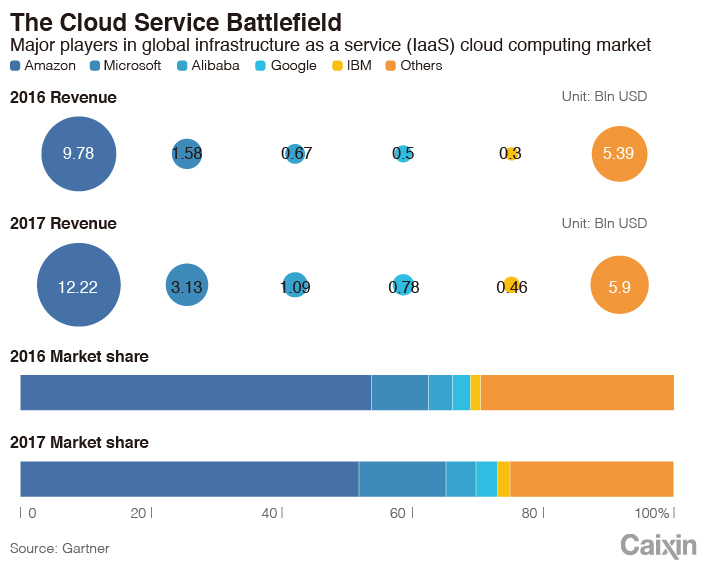 Domestic rivals have seized leadership in cloud computing and mobile services, leaving Microsoft far behind. But Nadella says Microsoft is in China to stay with long-term commitments. Over the past year, Microsoft’s stock surged, boosting its valuation earlier this year to well above $800 billion. Microsoft largely weathered the recent tech stock sell-off. Its market cap stood at $753 billion at the Black Friday early closing on Nov. 23, overshadowing Apple’s $746.8 billion, Google’s $725.6 billion and Amazon’s $726.6 billion. 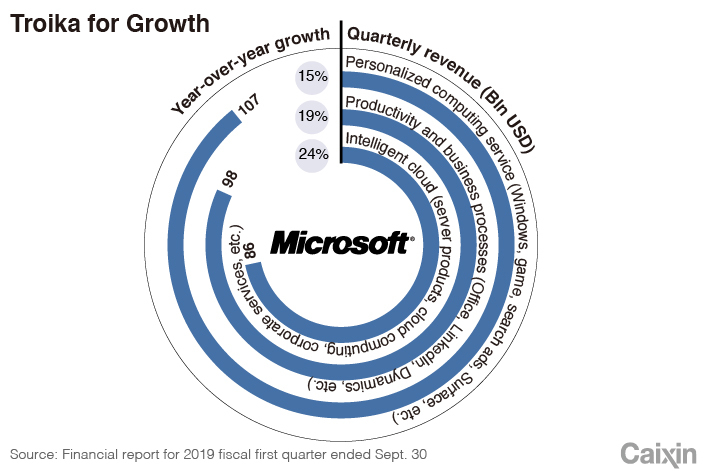 In the fiscal first quarter ended Sept. 30, Microsoft posted a better-than-expected revenue increase of 19% to $29 billion, reflecting strong growth in business-focused cloud services. In May, investment bank Morgan Stanley forecast that cloud business growth and the integration of the social networking site LinkedIn, which Microsoft acquired in 2016 for $26.2 billion, will drive Microsoft to grow at more than 10% for the next three years and push its market cap to $1 trillion within one year, the second company after Apple to touch that value. Nadella and retired CEO Gates represent two stages of Microsoft, Shun said. While Gates led the young company to grow from a small player to a leader, Nadella will steer Microsoft into a more mature and practical middle-age phase. “The world we are facing is much more complicated,” Shum said. 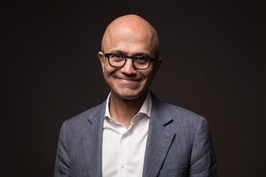 Fifty-two days after Nadella became Microsoft’s CEO, he initiated a major strategy change to make cloud computing the top priority and focus all product development on mobile applications. Microsoft started cloud computing research as early as 2008 ― two years after Amazon initiated its public cloud service Amazon Web Services ― but progress has remained slow. Five months later, he pushed through Microsoft’s largest job cuts, affecting 18,000 employees, to scale back the mobile device business Microsoft acquired in 2014 from Nokia. “It was painful, but we would miss opportunities if we didn’t do it,” Shum said. Changes in workflow followed. According to Mai Chaojun, Microsoft’s cloud computing and artificial intelligence (AI) division chief in China, the product development cycle at Microsoft has been slashed from three years to six month, and service staff and developers are required to respond quickly to customer demands to better adapt to the changing market. In March, Nadella made another major reshuffle by creating up two divisions, one overseeing the device-related business and the other, the cloud and AI business. The once-dominant Windows unit was split in two and merged into the two new business divisions. According to market data provider Canalys, Microsoft’s cloud computing service Azure ranks second with a global market share of 17%, behind Amazon’s 32%. “Microsoft’s shift to cloud service has proved successful, but in the AI era, it needs something new,” Shum said. The top new strategic initiative is AI. Microsoft has been adding AI elements to popular services like Office and Dynamics while exploring broader use of the technology in health care, retailing and other businesses, according to Shum. In July, Microsoft signed a partnership accord with retail giant Walmart to provide cloud services and AI-powered retail transformation. Microsoft also placed its bets for the future on quantum computing and augmented reality (AR). In 2015, Microsoft introduced its AR helmet HoloLens, a headset that allows users to interact with holograms. Alain Crozier, Microsoft’s China head, expects China to become the largest market for HoloLens in one or two years. There are more than 3,000 developers in China working on applications to use HoloLens in medical care, construction, education and others, Crozier said. No one can ignore the China market, especially its booming tech sector. Microsoft was one of the earliest global tech giants to tap into the world’s largest consumer market, although it has struggled bitterly for years against pirated versions of its Windows and Office software. In 2012, Microsoft became the first foreign tech company to launch a public cloud service in China, but the business has remained sluggish partly due to regulatory hurdles. According to data provider IDC, Microsoft held 4.9% of China’s public cloud market in 2017, lagging behind latecomer Amazon’s 5.4% and ranking seventh. Domestic tech leaders including Alibaba, Tencent and telecom operator China Telecom took the top positions. Many industry insiders criticized Microsoft for moving slowly in China, falling behind rivals in introducing new products in the country. 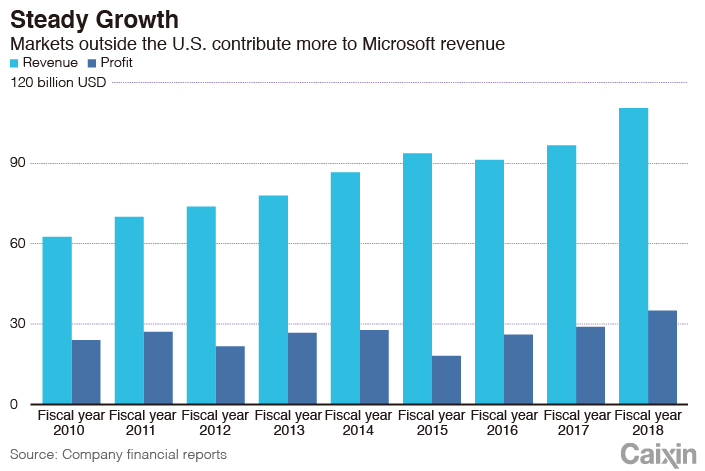 “Microsoft has slowed down in the cloud business in China in recent years, unlike other companies, which are more aggressive,” said Liu Xutao, an analyst at IDC. Crozier said Microsoft targets two categories of Chinese companies — fledging tech giants like Xiaomi Corp. and ByteDance that are in the early stages of overseas expansion and need offshore cloud services, and startups that have the potential to become the next generation e-commerce giant like Alibaba. But Yan Zhiqing, a former vice president of Microsoft China, said the company needs deeper changes to revitalize its China business by giving greater authority to the Chinese operations and restructuring local departments to improve efficiency of decision-making and develop customized services. Currently, most of Microsoft China’ departments are under direct supervision of headquarters and lack internal coordination, Yan said. “The organizational structure of Microsoft China shows where the ceiling (of its business) is,” he said. Nadella voiced more patience for the China business and said it will be a long-term project. “I think we're playing the long game,” he said. 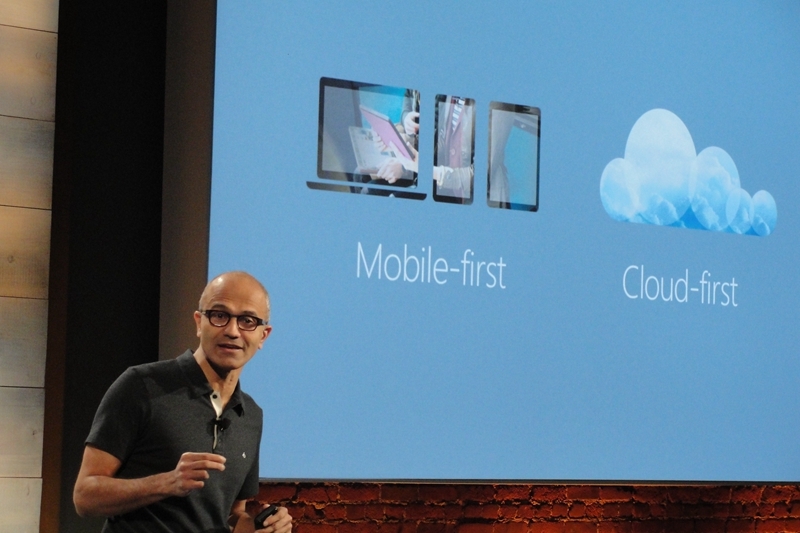 Microsoft is facing a challenging journey of transformation, Yan said. "Microsoft gained its competitiveness from its long-term leading position in sales, but rivals are catching up. And the real tough battles to win customers with technology capability and solutions are about to come."